MANILA, Philippines - The Japan concerts of Korean boy bands Big Bang and 2PM were selected as one of the best of 2012 by the Oricon music chart. Oricon's editor-in-chief recently published a list of the best 11 concerts in Japan which included the boy band's performances. The 11 concerts were chosen from the 141 concerts in Japan that the editor-in-chief attended in 2012. These are Big Bang Alive Tour 2012, 2PM Live 2012 Six Beautiful Days, Tatsuro Yamashita, Kazumasa Oda, Namie Amuro, Aiko, Uverworld, Ikimono-gakari, Keisuke Kuwata, Arashi, and Perfume. 2PM held the concerts in Japan at Nippon Budokan in May and June last year. “Although a member was injured prior to the concert so the odds were against them to perform with a 100% satisfactory performance, they were still able to achieve a handsome six-day stage. Their charms are their dancing with their strong built figures and the quality of their songs in addition to the members’ characters. They were able to shows their individual charms through their solo stages that changed each day and brought the fans to their feet. 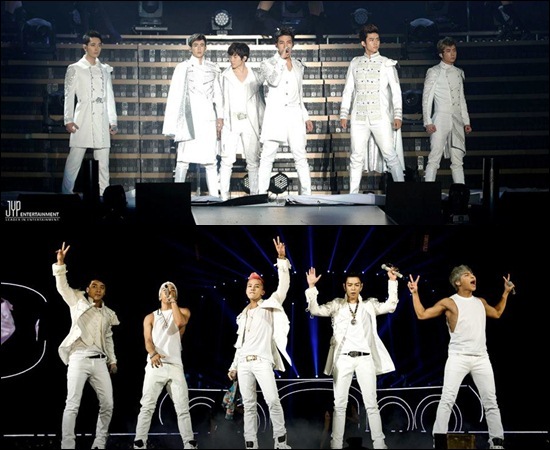 It was a large scale performance that made the stage feel cozy,” wrote Oricon's editor-in-chief, according to Allkpop.com. As for Big Bang, Oricon's editor-in-chief was surprised at the height of the group's maturity, adding their songs were addictive and the fact that Seungri spoke to the fans in Japanese was also an advantage. 2PM embarked again on their Japan concert with "Legend of 2PM," which kicked off in Fukuoka last Jan. 11 and 12. According to JYP Entertainment, about 150,000 fans are expected to attend 2PM's 13 concerts in Japan. About 20,000 fans attended the Fukuoka concerts held at the Marine Messe hall. "In particular, ‘Beautiful’ and ‘Masquerade’, the Singles that recorded #1 in Tower Records Singles Sales last year with the explosive love they received, distinguished 2PM’s powerful energy with the fantastical performances of the mermaid the mask dances," according to JYPE. 2PM also revealed the songs for their second full-length Japanese album "Legend of 2PM" that will be released on Feb. 13. 2PM will continue the concerts in Nagoya, Osaka, Tokyo, and Sapporo in February. Concerts will also be held a Tokyo Dome on April 20 and 21.